No one likes a smelly baby. 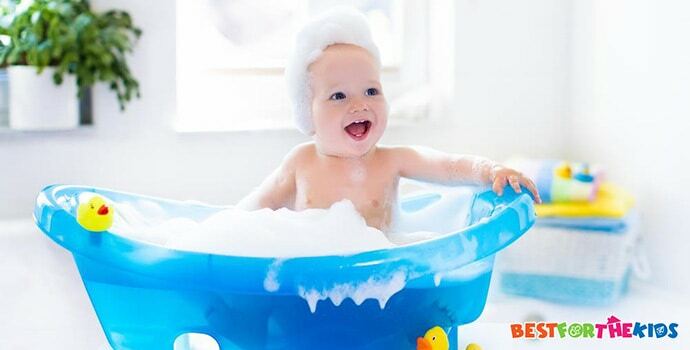 However, when it comes to bath time, it can sometimes get extremely complicated when trying to handle all the right products, keeping your baby happy, and playing with the bubbles, all while trying to clean your baby. I have found myself in this position countless times, and I started to think that there must be a better way to wash my baby without all of the chaos. Thankfully, there is. 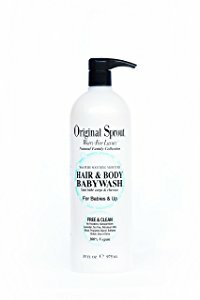 Searching online, I soon discovered a range of organic products that were designed to be both body wash and shampoo in one, saving me heaps of time when it came to bath time. The reason I went for organic products was that I simply didn’t want to be splashing chemicals, like formaldehyde, all over my baby, and I’m sure you don’t want to either. With all this in mind, here is a collection of some of my favorite body wash/shampoos to make this purchasing decision plain and simple. There’s no reason for this to be complicated. What Body Wash Ingredients Should I Avoid? Can I Choose a Body Wash with a Fragrance? My Body Wash Contains Parabens. What are These? When Do I Need to Start Using Baby Body Wash? Is It Possible to Over-Wash Your Baby? To start my list, I’ve chosen to begin with this awesome product that will change bath time forever. 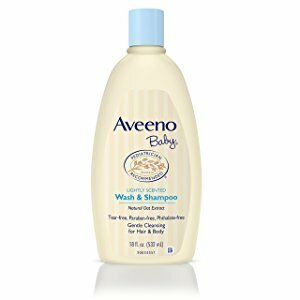 This all-in-one body wash/shampoo has everything you need while washing your baby, in one convenient bottle. Easily the leading feature of this product is its ability to moisturize your baby’s skin, nourishing it with vitamins and minerals to give your baby the softest skin while ensuring their hair remains soft and silky. Furthermore, all of these amazing benefits are all thanks to the all-natural and organic recipe and ingredients, guaranteeing that there are no artificial or potentially harmful chemicals anywhere in sight. This puts the well-being and health of your baby first while giving you the results you would expect from a leading body wash product. Even the light fragrance included with the bottle is made from all-natural ingredients, meaning your baby is going to smell great while being safe. What's Great About It: Thanks to the specially designed and expertly blended recipe, this body wash is also certified as being 100% vegan, meaning that eco-conscious parents, and parents who simply care for their kids and the environment, have a body wash that’s suitable for their beliefs. Next up, I’ve chosen this outstanding body wash/shampoo that’s designed to provide you with incredible washing results in a compact bottle that will last for ages, saving you a ton of money in the long-term. This gentle and caring wash is professionally crafted to produce a tear-free experience for your baby, ensuring that every bath time is full of smiles, bubbles, and laughter, rather than stressful tantrums. In fact, this recipe is so gentle that it’s even been proven to be perfectly safe for newborn children all the way through the years as they grow up, meaning you’ll never introduce any potentially harmful or chemical-ridden wash to their daily routine. Inside each bottle, you’ll find an exclusive natural oat extract, ensuring that your baby smells great, is super clean and hygienic, ready for whatever life gives you next. What's Great About It: This brand markets itself as being highly recommended by leading pediatricians in the United States, leaving you safe in the knowledge that you’re buying a quality product. If you are in need of a high-performance body wash/shampoo that’s gentle on your baby’s skin but provides you with outstanding results, there may no need to look further than the Puracy Baby Shampoo. This unique and highly-developed formula has been expertly produced and designed by a leading team of doctors, granting you access to superior results and safety. This highly rated product is proven to give you tear-free results for happy bath times, while proactively moisturizing and nourishing your baby’s skin, keeping it healthy while ensuring your baby looks and smells amazing. What's Great About It: In addition to all these amazing benefits, this body wash/shampoo is non-toxic, 100% natural, hypoallergenic, biodegradable, gluten-free, vegan-approved, certified cruelty-free and has been proven to be involved with no animal testing, ensuring you’re doing what’s right for your baby and the world. The California Baby Calming Shampoo/Body Wash is one of those products that does exactly what it says on the bottle. This specially formulated recipe only uses ingredients that will calm and nourish your baby’s skin during bath times, leaving their skin soft to the touch, clean and hygienic. Once rubbed into your baby’s skin, the product will gently cleanse the pores and skin without being so rough that it strips away the essential oils. What’s more, it does the same for your baby’s hair, giving it a brilliant shine while ensuring the oils for vital growth are still in place. The recipe of ingredients doesn’t contain any potentially harmful chemicals such as DEA, numbing agents or sodium lauryl sulfate, ensuring every bath with this baby wash is tear and stress-free. What's Great About It: So that you can make the most out of your budget, this bottle of body wash and shampoo is available in four different sizes, enabling you to easily choose the one that’s right for you, so you make your budget stretch as much as you need it to. To conclude my list of favorite body washes, I’ve chosen this outstanding organic formula that proactively moisturizes your baby’s skin, making it ideal for babies who have any type of skin, including sensitive. This means you can help fighting the stressful and upsetting symptoms of conditions such as dry skin, eczema, diaper rash, heat rash, baby acne or any other types of skin condition that your baby may be suffering from. Furthermore, this awesome product is balanced with a PH level of 6-7, meaning it’s perfectly neutral and won’t cause any damage to your child’s skin. What's Great About It: This market-leading formula is designed by the Organic Sprout founder, Inga Tritt. This product clearly states that she worked alongside chemists and experts from around the world, ensuring that this product and recipe is the best it can be for your baby, guaranteeing quality, safety and results. More in Organic Baby Stuff: What's the Best Organic Baby Food? With all these amazing products in mind, now comes the difficult decision of trying to find the best product to suit your little one. Scroll down to discover my comprehensive buying guide, detailing everything you need to know to make the best decision possible. There’s one main chemical that should always be avoided when purchasing baby body wash and it’s more commonly known as SLS. This translates into Sodium Lauryl (Laureth) Sulfate and the best way to describe its dangers is that it’s typically found in industrial cleaning solutions. SLS is a very common chemical found in all kinds of body washes for both babies and adults, and can also be found in mouthwashes and laundry detergents. Its primary purpose is to froth up your cleaning product into bubbles and foam, but it’s an extremely cheap chemical and has been proven countless times to cause skin irritations. Of course, every parent wants their baby to smell nice, but this is an important thing to consider. With adult body washes, the formula may contain chemical ingredients to create the fragrance; in fact, the industry has over 3,000 chemicals to choose from. Adult skin is a lot more durable than a baby's skin and can withstand the effects of these chemicals. However, babies that come into contact with these powerful chemicals may experience some skin conditions which can be anything from rashes to irritations, so they are best avoided at all costs. This is one of the most important chemicals you want to avoid when choosing the right baby body wash for your baby. The paraben chemical is used in body washes, both child, and adult brands, as a chemical preservative. This preservative stops bacteria growing within the formula, so the product lasts longer. In body washes, some of the most common versions you may find include propylparaben, methylparaben, and butylparaben. And yes, these complicated names are as scary as they sound. Time and time again these paraben chemicals have popped up in scientific studies and the news for their dangerous carcinogenic effects. What’s more, one study even found that 99% of all breast cancer tissue samples contained some form of paraben. To put that into perspective, it’s estimated that over 85% of all skincare products contain paraben. When you think about it, this is really scary stuff, and I definitely don’t want these chemicals on my baby’s skin or anywhere near them. While it’s true that organic products may be more expensive, when you consider all the aspects above and the fact that organic products don’t contain any of these artificial products, as a parent, organic is 100% the way forward. In theory, newborns won’t need body wash since they are not really getting dirty, but of course, you’ll need to wash them, especially after dinner time and even more so if they’ve been handled all day by family and friends. The real concern comes in when your baby turns into a toddler and starts moving around on their own. When they reach this stage of their life, your children are going to be going outside and getting dirty while interacting with the world around them. This may make your heart skip a beat, but in fact, it’s highly recommended that you let your child get outside and get dirty. However, you don't want that dirt to stay on your child’s body forever, which is why it’s so important to get high-performance body wash to clean it all away. This may sound like a silly question, but it’s one I hear all the time. In fact, it’s completely possible to over-wash your baby, and it can lead to some problems. Obviously, if your baby is dirty, they’re going to need washing, but it’s common for parents to take things too far. It’s worth remembering that a baby’s skin has essential oils, in particular, one known as sebum, which creates a barrier for water and moisture. By continuously washing your baby, you can remove these oils from the skin which will cause the moisture to leave, which will almost always result in dry and cracked skin. As a parent, there’s no need to be anxious or confused when it comes to buying the perfect body wash/shampoo for your little bundle. Instead, take your time, read through your options and discover which body wash is best for your child. This way, you’ll know exactly what you are doing is right for your little one.